See this soup? I had it for dinner yesterday. I took this picture just after I finished cooking. A moment after I had scattered a sprinkling of parsley on top. Just before I sat down to eat it. 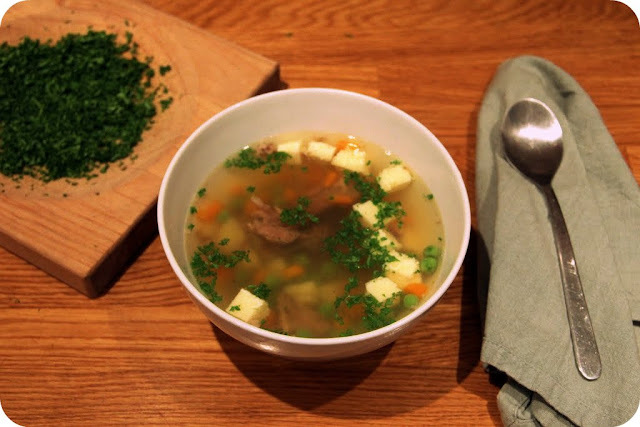 It's a simple beef broth with meat, vegetables and potatoes. It took me a full day to make. And that, Ladies & Gentlemen, is why I love cooking! I had not been feeling well. Down and out with a full-blown cold, probably due to the changing weather. I was taking a sick day. I was home by myself. Nobody there to care for me. So I thought I'd take good care of myself. I made this soup between naps and watching recorded TV. It all started with the leftover beef joint from Sunday lunch. Bones and all. I placed it in a big pot and covered it with water. I added a carrot, an onion, some parsley stalks, peppercorns, a bay leaf and some sea salt. I let all that simmer for a good two hours. I strained the soup and salvaged the meat and carrot and let it cool a little bit. I then cut the carrot into very small cubes and picked the meat off the bones. All the meat. Every last little morsel of it. I cut that into cubes as well and put it in the fridge. My beef broth was then left well alone for some time. It needed to cool, so that all the fat would collect on top. I skimmed it off. I broke and separated an egg. I set the egg yolk aside to use later. I whisked the egg white into the cooled and skimmed broth and brought it back to a rolling boil. When the egg white cooks, it rises to the surface and binds all the impurities that are in the broth, which clarifies it. I took the soup pot off the heat and strained it again, this time through a clean dish towel. What slowly and steadily dripped down into the new, clean pot was a clear and fragrant consommé. Just watching that liquid collect made me feel purified somehow. And the savoury steam rising up from the soup cleared my head. I whisked my egg yolk and another whole egg with a bit of milk, salt & nutmeg. I poured the mixture into a small plastic bowl and set it afloat in my tiniest pot that I had filled with water. As the water slowly heated up, the egg set into royale, or Eierstich, my favourite soup garnish from childhood. You cannot let the water boil, you just need to let it simmer slowly and be patient. Waiting for my egg to set, I heated the broth for a third time. I cut a few potatoes into dainty cubes and added those to the pot. They took about fives minutes to get to al dente. I decided some frozen peas would not go amiss. I added them, too. I retrieved my meat and carrot from the fridge and in the soup it went. While everything was heating up, I took the set egg out of its bowl, running a knife carefully around the edges. Out came a little cake of pale yellow, mottled with tiny air bubbles. I did some more cubing and dropped the egg pieces into my pot on the stove. I finely chopped some fresh, greener-than-green parsley and set it aside. Just as it was getting dark outside, I got myself a spoon and a napkin. I fetched a bowl and ladled some of the hot soup into it. I made sure I gave myself a lot of meat and vegetables. At that moment it occurred to me that I wanted to write this post. I paused to take the picture and then gathered my thoughts while I was sitting at the dining table, eating. The soup I had made was nourishing. It tasted salty and beefy. The peas added some pop, and the carrot and potatoes were comfortingly soft. The parsley on top gave an aroma of gardening. The consommé was a rich golden colour. There were specks of green and orange and cream floating around in it. I could feel that this dish was going to help me get better. But not only eating my soup was nourishing. The whole process of making it had done me good. I had made this meal with just myself in mind. I had made it for a sick me, hoping to make myself regain energy. I had carefully added all the ingredients I like. I made this soup from scratch, using remainders of another meal that might otherwise have gone to waste. I had used different methods of cooking and not once did I need to refer to a recipe. This was cooking that came from the heart. Rituals that have been with me since I was a little girl, hanging out in my grandparents' kitchens. I took my time to go through each step. Even though I was feeling unwell, focusing on making myself dinner distracted me from my headache, my tired body and my stuffy nasal passages. Doing something I love felt like the best medicine. And I love to cook. I love to cook because cooking is all about taking time and taking care. I love to combine ingredients and creating something new and wonderful. Making a meal combines a little kitchen magic with a little confidence. Cooking is about satisfying your needs, and the needs of the people you care for. Spending time in the kitchen is about patience and achievement. Cooking is nourishment for the body, and nourishment for the brain. Cooking is all about love. 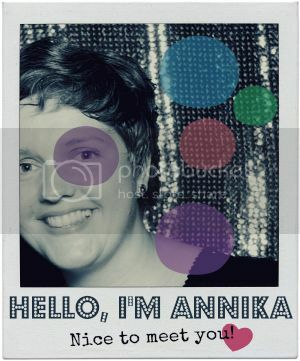 Hi Annika! I'm sorry you're feeling poorly....although, I'm glad this soup made you feel so much better. I read this post through completely and I really enjoyed reading each step of the cooking process. I'm not sure if I could be that patient....I hope you're feeling better. I hope you feel better. I just adore the sentiment of this post. Cooking is one of my very favorite ways to nurture. And your soup sounds delicious!